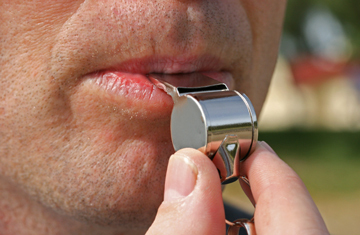 Why did this company get the maximum penalty allowed under federal law ($250,000) in a whistleblower retaliation case? Jason Raye worked as a train conductor for a subsidiary of Pan Am Railways. Raye noticed a pile of old railroad ties next to a track in a railyard in Waterville, ME, on Oct. 5, 2011. He reported it as a tripping hazard to his manager. Less than three weeks later, Raye stepped off a train onto that same pile of railroad ties and badly sprained his ankle. He missed a day of work as a result. Raye said he stepped down from the train cautiously, but still lost his balance on the unstable pile of ties. Pan Am found he broke the safety rule and gave him a formal reprimand which was put in his personal file. Raye hired a lawyer who sent a complaint to OSHA on Dec. 6, 2011, without Raye first reviewing or signing it. The complaint accused Pan Am of violating the Federal Railroad Safety Act (FRSA) by retaliating against Raye for reporting a safety hazard and his injury. OSHA sent a copy of Raye’s complaint to Pan Am, seeking a response. Pan Am’s Vice President of Transportation reviewed the complaint and thought there was a “major discrepancy” between what it said and Raye’s previous description. Pan Am didn’t speak to Raye about the alleged discrepancy. Nevertheless, the company brought a second round of serious disciplinary charges against Raye, threatening him with termination. The employer alleged Raye had provided false statements to the company and/or a government agency. Raye’s lawyer amended the OSHA complaint to include an allegation that the second set of charges amounted to Pan Am retaliating against Raye for having filed the original OSHA complaint. Pan Am held a second disciplinary hearing for Raye where he explained that he hadn’t read his lawyer’s original OSHA complaint before it was sent in. Raye said his original description of what happened when he was injured was correct. Pan Am threw out the second set of charges against Raye. OSHA rejected Raye’s claim that Pan Am had retaliated against him for reporting his injury and a safety hazard. However, the agency agreed with Raye that Pan Am had retaliated against him by bringing the second set of charges. Pan Am objected to OSHA’s second finding, and the case went before an administrative law judge. Pan Am argued it could show several instances in which similar disciplinary action was taken against its employees, proving this wasn’t a case of retaliation. The ALJ found Pan Am had retaliated against Raye for filing an OSHA complaint. The judge rejected Pan Am’s argument that it had taken similar action in previous cases. The ALJ found those instances weren’t comparable to Raye’s circumstances. Pan Am was ordered to pay Raye $10,000 in emotional distress damages and $250,000 in punitive damages, the maximum allowed by the FRSA, because the employer had “utilized the process to intimidate and discourage protected activity, not only by Raye, but other employees of Pan Am as well.” Pan Am appealed the decision, but it was upheld by the Department of Labor’s Administrative Review Board. The employer appealed again to the First Circuit Court. The $250,000 punitive award was excessive. The First Circuit agreed with the ALJ that the cases Pan Am said were comparable to Raye’s weren’t similar enough to his to make the company’s argument. The federal appeals court gave weight to Pan Am’s failure to ask Raye about the perceived discrepancy between what he said and his lawyer’s OSHA complaint. “Substantial evidence supported the ALJ’s conclusion that Pan Am overstated the significance of the discrepancy,” the court wrote in its opinion. As for issuing the maximum punitive damages penalty, the court also let that stand but not without expressing some reservations about it. Indeed, in Pan Am’s launched formal charges against 99% of employees who suffered an injury that was reportable to the Federal Railroad Administration.